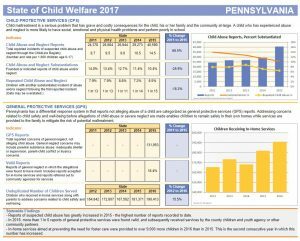 Foster Care Entries and Exits: For the first time since 2012, the number of children entering foster care in Pennsylvania (10,567) was lower than the number of children exiting the foster care system in the same year (10,635). 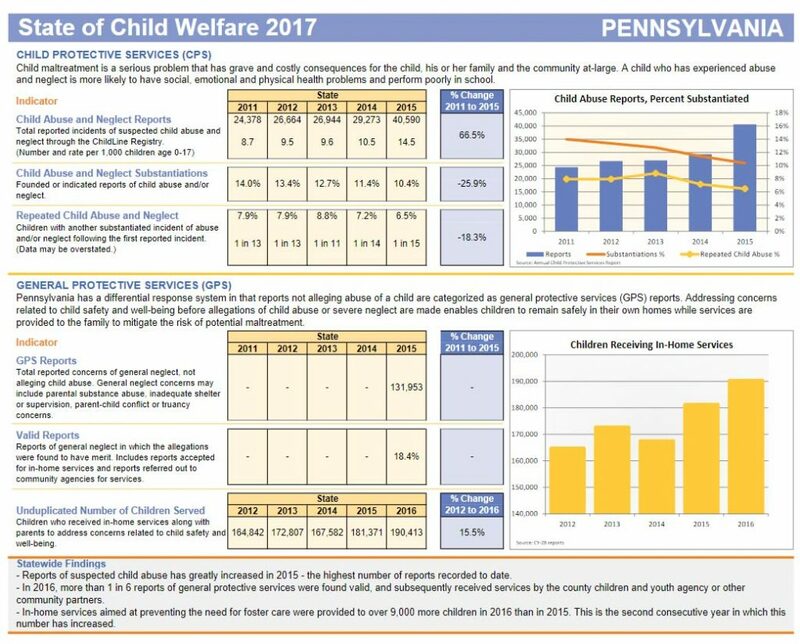 In a year where reports of suspected abuse and neglect increased by over 38%, this demonstrates Pennsylvania’s commitment to a permanent family for children and youth who experience child welfare placement. General Protective Services Reports: 2015 was the first year that general protective services (GPS) reports were collected by the Department of Human Services (DHS). In prior years, this information was not required to be submitted to DHS and was maintained by county children and youth agencies. Some typical GPS cases include parental substance abuse, inadequate housing, truancy, lack of supervision or abandonment, or other circumstances that threaten a child’s safety and well-being. County children and youth agencies are often able to intervene in these situations and provide or refer for services that address these issues, decreasing the likelihood of a subsequent indication of child abuse or neglect. Nearly 132,000 GPS reports were received in 2015 of which 18.4% were validated. Reports of Child Abuse and Neglect: Reports of child abuse and neglect continued to climb in 2015. The increase is likely due, in part, to 2015 being the first full reporting year following the passage of over two dozen child protection laws that drove increased public awareness. Foster Care Placements in Family-Based Settings: The number of children in foster care on a typical day in 2015 who were placed in a family-based setting (pre-adoptive homes, relative and non-relative foster homes) continues to rise, reaching 82.5 percent or its highest level in five years. Additionally, the use of family-based settings increased for children and youth who entered foster care for the first time in 2015. However, children and youth who re-entered the foster care system in 2015, after being reunified with their families, were more likely to be placed in congregate care settings. Most re-entries into foster care are experienced by 12-17-year-old youth who oftentimes have complex needs. Pennsylvania should continue its efforts to place children in family settings whenever possible as they are 7 to 10 times less costly than congregate settings and have better outcomes for kids. Children and youth who are placed in family-based settings are at less risk of delinquency, teen pregnancy, homelessness, unemployment and incarceration as compared to their peers placed in congregate care settings.